I am, a rather big fan of Zainab Jagot Ahmed and her simple, tasty recipes for indian-inspired foods suitable for babies, toddlers and the WHOLE family. Zainab's new book, Easy Indian SuperMeals for babies, toddlers and the family is released next month and I got a sneaky peek - I have to say that if I had to chose one baby and toddler cookery book to recommend to new (or experienced) parents, then this would be it. In our house, we eat an Indian-inspired meal on two to three evenings a week and have done ever since our girls were teeny and tiny. 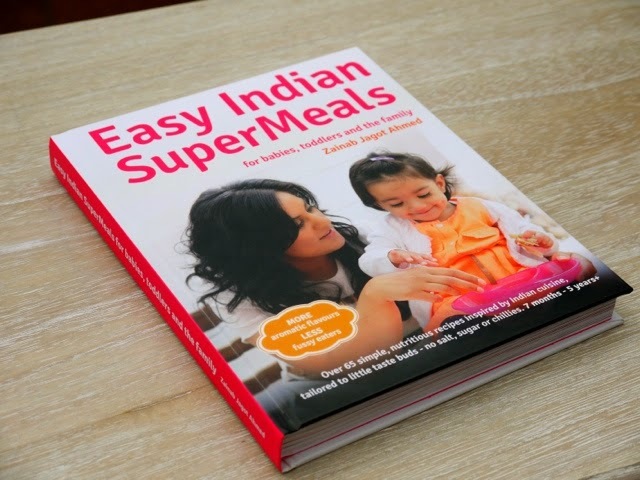 Easy Indian SuperMeals (available to pre order now) features recipe ideas packed full of nutrients and exciting textures and flavours suitable from stage 2 of weaning (at around 7 months old). We love the sweet fish and fruit curry which is suitable for small babies just taking their first foray into the exciting world of food - made with yoghurt, apple, pear and banana as well as white fish fillets and a selection of gentle spices such as ginger, garlic, cumin, coriander and turmeric - it is just as yummy as a grown up! Later in the book there are recipes for finger foods such as apple french toast with blueberries and cinnamon or minted green beans. And then for the more adventurous toddler there are some beautiful curried dishes designed to start building a love of healthy, exciting spices - Cardamom Chicken Curry is a tomato based curry with a hint of sweet cardamom and an optional zing of fresh green chilli. 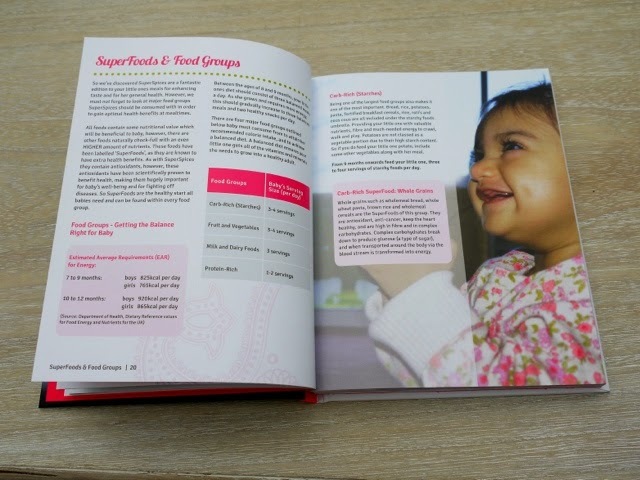 Zainab's own daughter is now school age so the final section of the book features "booster snacks" and quick-to-prepare meals that are great for the post-school rush! I find it hard to put into words how much Zainab's approach to mellow weaning and family mealtimes aligns with our own family's approach to food. But, even sharing a love of Indian-inspired healthy food for kids, I still find a lot of new inspiration in Zainab's recipes. I recognise a lot of the recipes in Easy Indian SuperMeals from Zainab's first electronic book but this new cookery book is packed chock-full of recipe ideas and I think I will be trying new things for many months to come. If you're wondering what's so "super" about these Easy Indian Superfoods; it's the ingredients. Each of the recipes features 'SuperSpices' which have been used for many generations for their health properties and antioxidant levels. Combine these tasty spices with SuperFoods such as whole grains, nutrient-rich fruits and vegetables, a good mix of dairy and protein items as well as oily fish, olive oil and you have SuperMeals! The first section of this cookery book features a lot of common-sense, scaremonger-free information about food groups and how to make sure your toddler gets a healthy, balanced diet that can set them on the right track from day one of their weaning journey. It always puts a smile on my face when I see my own daughters enjoying Indian foods as much as I do - just last week Lara, my eldest, came home at the end of the day and asked me what's for dinner. I told Lara we were having "curry"; she originally seemed a bit disappointed when she found out it was homemade curry and not "ordered curry" (her term for a takeaway) and I felt a bit deflated. A little while later, as I served her "Classic Keema Curry" made with minced lamb, Lara exclaimed "Oh yay... I LOVE this curry" and demolished an adult-sized serving of it! You can find out more about Zainab and her cookbooks at www.ZainabJagotAhmed.com and on facebook. 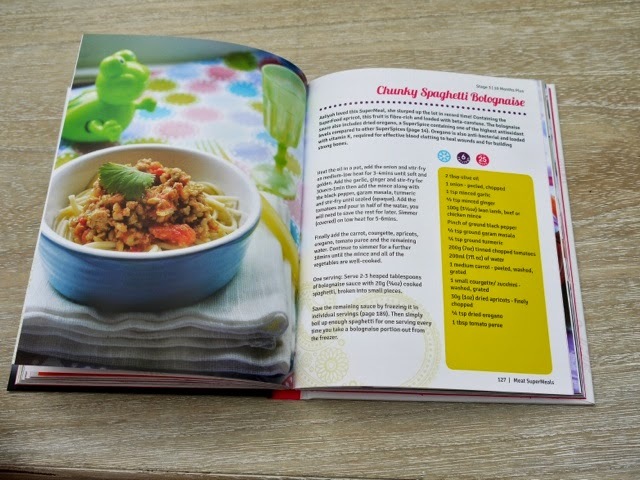 To celebrate the launch of Easy Indian SuperMeals for babies, toddlers and the family, I'm giving away a copy of the book to one lucky Mellow Mummy reader so you will be among the first people to get your hands on this fab new recipe book. To be in with a chance of winning a copy, all you have to do is to leave me a comment below with the name of one of your tried and tested family-friendly meals that you like to cook. The winners will be selected at random from all valid comments received by 11:59pm on 8th September 2014.